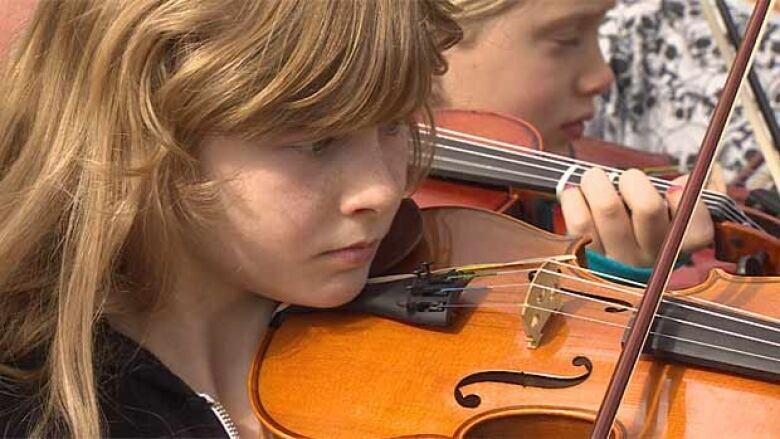 The Vancouver School District's popular elementary school music programs will be changing this fall, with students having to wait an extra year before picking up their instruments. Next fall the Vancouver band programs, which are offered at 52 Vancouver schools, will start in grade six instead of five, while the strings program will start in grade five instead of four. The changes will help cut costs without cutting the programs entirely, said associate superintendent Maureen Ciarniello. "There's an opportunity there for the board to effect some savings, but at the same time not negatively affect the program integrity and the opportunity for students," said Ciarniello. "Some parents are going to wish maybe that their grade five could start band and they won't be able to. But you know I think that's a minimal risk. The program isn't gone — it's just a delay for a year," she said. The programs were nearly cut completely last year, but were saved when the Ministry of Education released extra funding. Averill Groeneveld-Meijer, the chair of the Parent Advisory Council chair at Southlands Elementary School, expressed concerns about the cuts. "It makes me feel badly about the public system school overall. It makes me feel like it's always the arts. If you walk into an elementary school today you won't find an art teacher, you won't find a music teacher, in fact you won't find a gym teacher, you will find no specialist teachers," said Groeneveld-Meijer. Farah Shroff, co-chair of the Vancouver District Parent Advisory Council, was also disappointed with the cuts. "Unfortunately it's just a slow erosion of an excellent program," said Shroff. The programs will also get more expensive, with participation fees doubling from $25 to $50.